This week we received two Boss CE-2 Chorus pedals in different states of disrepair. The first that arrived is pictured above in the left panel. It arrived exactly like that: missing parts, disassembled, and painted black. Although the original paint was beat to hell it still looks better than the faded black paint. Surprisingly the circuit board was 100% original so the restoration was mostly tracking down appropriate replacement hardware. The original pedal was designed to run on Boss’s ACA120 adapter. This is the unregulated 9V adapter which they’ve long phased out and replaced with the PSA120 9V regulated adapter. Ibanez, Danelectro, DOD, Digitech, Voodoo Lab, Boss, and almost every other current pedal manufacturer uses a regulated 9V power supply. If you hook up a stock CE-2 to a regulated 9V adapter you’ll likely be providing slightly less voltage than intended and– while it will in no way damage your pedal– will have a dimmer LED. 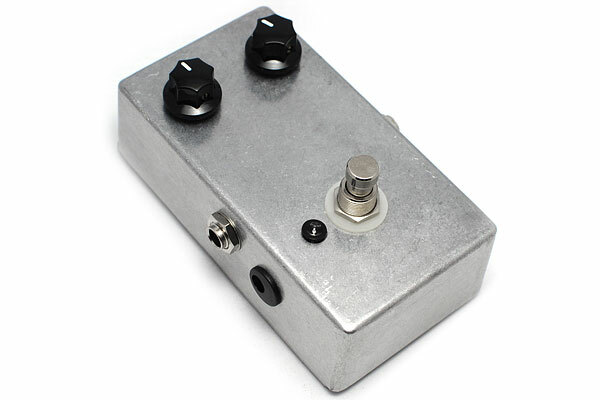 We modify the CE-2 and any other pedal designed for the Boss ACA120 adapter to run on a modern powder supply. This mod is also built into the cost of our Overhaul modification. Speaking of the Overhaul modification, it also includes sonic and aesthetic upgrades. We replace key capacitors in the audio path including electrolytics with Panasonic metal film caps. Also replaced is the main audio op-amp for more headroom and a cleaner tone. Last we install a blue LED and set it to pulse to the rate of the chorus when activated. This makes a great pedal even better! Here is another CE-2 we received as nothing more than a circuit board. The casing, jacks, footswitch, knobs, and pots are all replacements. Converted to true bypass and installed a large LED for better visibility. All fun stuff and these two exact pedals are currently (as of 9/25/2012) are listed on eBay! I’d love to see someone commission a true stereo output for their CE-2.. This entry was posted in Modifications, Rehousings. Bookmark the permalink.